As these were so biscuit-like in their nature, they could help but Crunch like a biscuit rather than a crispy, snappy thinly cut Crisp. There was a good rate of degradation. 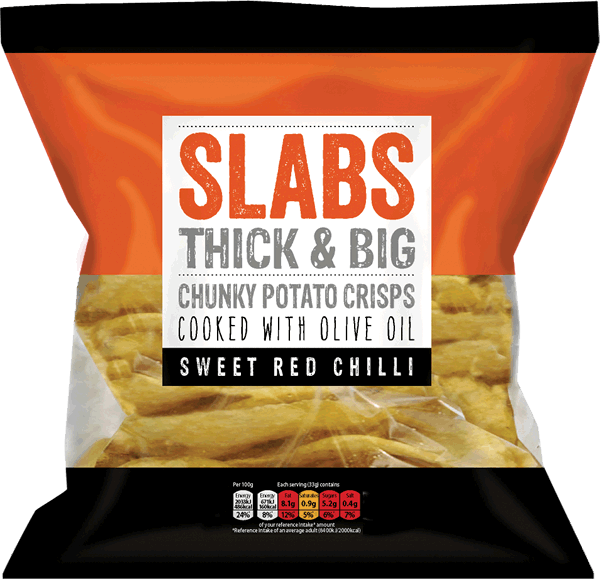 These were extraordinarily thickly cut Crisps. There was also a massive amount of visible seasoning. We would ordinarily only allocate five stars to those with a heavily oil blistered surface and beautifully deformed potato slices with bends, curls and gnarly edges. However, these should not be knocked down simply because they were so meaty and instead praised for how great they looked. A Nose Plunge Test revealed a mild Chilli Sauce aroma. The flavour is based on the popular Thai Sauces of this nature, but there was a slight overwhelming Potato backdrop to these. Neither were they particularly Sweet. However, while they were not completely comparable to Sweet Chilli Sauce, there was a mild Chilli flavouring and a tinge of Oriental Spices.